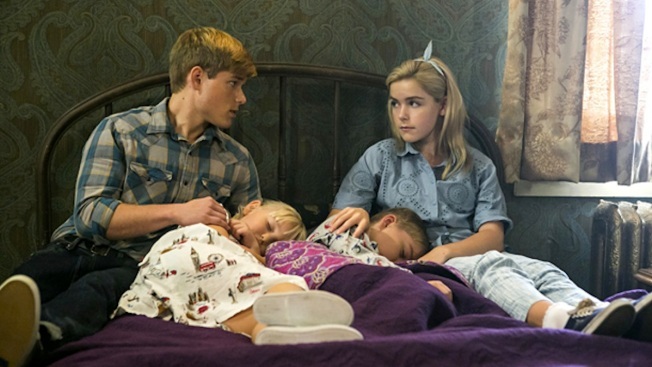 Mason Dye (l.) and Kiernan Shipka in a scene from "Flowers in the Attic"
Who knew Guns N' Roses' "Sweet Child O' Mine" could be so damn creepy? Flowers in the Attic is the gothic and gruesome tale of four siblings who are locked away to live in an attic, after a family tragedy suddenly removes them from their perfect childhood. And yes, believe it or not, it's even more amazing (and creepy) than it sounds. Take a look at the brand-new teaser trailer and don't miss the premiere of "Flowers in the Attic" Saturday, Jan. 18 at 8 p.m. on Lifetime.